Just when you thought that the Cleveland Browns could not possibly look any dumber, they went and outdid themselves. It’s not that their new updated logo is so terrible, IT’S THAT IT’S EXACTLY THE SAME! Yes, the terrible orange helmet is a little more nauseatingly orange, and yes, the alternate bulldog logo apparently became a puppy, but other than those minor details, everything is the same. 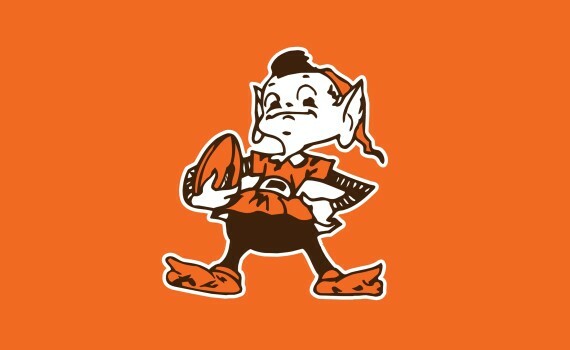 When your organization is as mocked, ridiculed, and kicked around as the Cleveland Browns, why set yourself up for failure by promising a logo change and then delivering anything but? And the wording of the press release from the team; let’s just say they reached a whole new level of stupid. So here’s to another embarrassing season with slightly darker orange helmet logos. Although, I almost forgot, they’re delivering a uniform change too, on April 14th. I’ll be over here on the edge of my seat; let me know when it’s ready. Respect the past. Represent the future. Our updated helmet logo is reflective of today’s modern Cleveland – the design honors the past while evolving into the future. The iconic brown and white stripes stand tall over the orange helmet – a new orange color that matches the passion of the Dawg Pound. The new brown facemask represents the strength and toughness of Cleveland. 2015 marks the 30th anniversary of the Dawg Pound – bestowing a unique opportunity to modernize the symbolism of the Dawg Pound through an evolved logo. The Dawg Pound represents one of the most iconic fan bases in all of sports. The Dawg Pound is a unifying identity of all Cleveland Browns faithful. It’s tough and exemplifies the “Play Like A Brown” attitude. With one passionate voice – the DAWG POUND BARKS TOGETHER. The contemporary redesigned wordmark is simplistic and utilizes a stronger, bolder font. The new Cleveland Browns uniforms will be unveiled on Tuesday, April 14, 2015.